Usually, a verb is that part of a speech used to indicate the state of being. It is also used to describe an occurrence or an action. In most cases, a verb is well understood by the work it does rather than talking about it or trying to describe it. For instance, the word “rain” can be taken as a verb or a noun; and therefore, what a verb does will clearly bring out the difference. Simply, a verb will move sentences along in many different ways hence, different kinds of verbs. A verb is an important part of an English question or sentence. Actually, it is likely that all questions and sentences have a verb in it. This highlights how important verbs can be. It signals an occurrence, an action or a state of being in the sentence or question. As the names suggest, action verbs primarily express action. For instance, sit, eat, cycle, etc. They describe things and actions that occur rather than the state of something. An action verb is primarily applied in a progressive aspect commonly used for all actions that are in progress. Most of the action verbs are categorized as transitive or intransitive. What this means is that, some verbs are used along with direct objects while others don’t. The object here can be a thing or a person receiving an action of a certain subject. Verbs that are used together with a direct object. The object can be a thing or a person. 1. Richard owes Jimmy some money. 2. He feeds his children while their mother is away. 3. She makes jewelry to sell at the market. Verbs that don’t have a direct object for their meaning to be communicated. In most cases, they are followed by an adverb, adjective, verb complement or a preposition. 1. His sister diedof Malaria. 2. We arrived at school very late. 3. Mary responded to all questions in the exam. Among the many kinds of verbs in English, auxiliary verbs and lexical verbs are very useful. 1. If all goes well, I will be going home today. 2. We shall meet tomorrow in the afternoon and discuss the matter we left pending. 3. We may go shopping anytime from now because the rains have stopped. All other verbs other than auxiliary verbs. It is a main verb. 1. He will be coming home for dinner. 2. He rested in the shadow after a tedious job in the garden. 3. Thomas will be organizing the group before he travels. 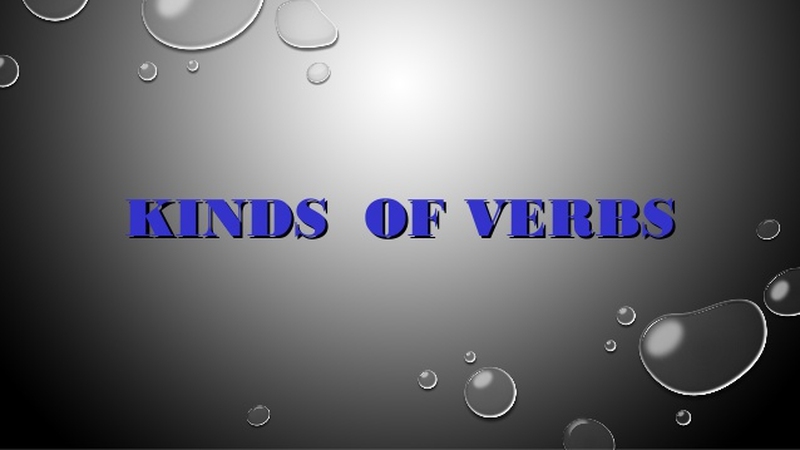 A verb basically used to show a process, an action or a sensation rather than a state. 1. He drives carefully down the hill. 2. Mathew is growing old. 3. She threw a stone at me angrily. A verb basically used to define a situation or state. 1. What do you have to say about his behavior nowadays? 2. You seem too tired to continue working today. 3. Do you know anything about verbs? A verb that agrees with a given subject in a sentence. It is usually marked for tense. 2. Jane promised to change her behavior. 3. Gladys said that she enjoyed learning more about verbs. A verb that has no distinction in different tense. It cannot be used unaccompanied as the main verb in a given question or sentence. 1. You can expand your boundary. 2. We may leave after 10.00pm. 3. She had a reason to smile. Dynamic verbs and stative verbs are among the most common kinds of verbs in English which one should know about. A verb whose past participle and past tense is attained by adding –d or –ed or –t for some. It is sometimes called a weak verb. 1. I accepted the offer. 2. He has just arrived. 3. He fenced the area. Also called a strong verb. It does not usually follow the rules for common verb forms. They usually do not have the predictable –ed ending. 1. He got his business running at the right time. 2. We went (go) home early. 3. They came by bus on a Saturday morning.